Immersed in the green hills of Monferrato where the magic of colors envelops the endless vineyards with the Alps on the horizon. Made with care and passion respecting the architectures and traditional materials, according to the principles of energy saving and eco-sustainability: photovoltaic plant for the production of electricity and Geothermal plant for heating, cooling and production of sanitary hot water. In the Monferrato the summer discovers its scents and local specialties in a myriad of food and wine festivals, offering inimitable colors of its soft hills and art cities. The Massetti family Mirco and Laura with their three children Alice, Ginevra and Samuele, lives on the first floor of the villa, is pleased to welcome you in their cozy Blue House located in Montaldo Scarampi in the province of Asti, in the heart of Monferrato, Unesco Heritage, in a strategic position starting point of different itineraries: from a walk through palaces, towers and medieval streets to a trip to rediscover the typical products of the Langhe, Monferrato and Roero or even an excursion through the woods and vineyards maybe on horseback to a stop in the various local cellars for tasting their fine wines. Beautiful place in a good location. Mirco and Laura are very hospitable and make sure everything is as described. Laura and Mirco prepared greatly for our baby by providing a babychair, cot and stroller. Kitchen and bathroom are not extremely spacious, but have all the facilities you need. The climate indoors is comfortable due to air conditioning in the floor. The pool is fabulous and was still a pleasant 31C, even half September. The view is great, overlooking many fields of grapes, as it is a real wine-area. There are many dining facilities in the area, or places where you can grab a fast pizza for small prices. Two decent supermarkets in the town and shopping centers within 30 minutes drive. This home is fantastic! It is in the countryside outside of Asti in the Langhe surrounded by beautiful hills. The house is very large and extremely comfortablle for our family of 6. The nice pool beautifully sited and a nice place to hang out - along with covered porches and terrace. Lovely house, and lovely landlord! The house is very clean, and very enjoyable this is definitely worth a visit. Unser Aufenthalt bei Mirco und Laura und ihren Kindern war erstklassig. Die Vermieter sind überaus freundlich. Sie haben uns für unser kleinstes Kind eine Menge an zusätzlicher Ausstattung zur Verfügung gestellt. Die Kommunikation lief bestens. Einen Pool mit Dach zu haben war gigantisch, da wir mit dem Wetter nicht so Glück hatten. Somit aber Baden trotzdem möglich war. Unsere Vermieter haben uns extra für den Zeitraum unseres Aufenthaltes Veranstaltungen usw. ausgedruckt. Wir haben uns sehr wohl gefühlt. Im Dorf waren wir seltene Touristen, es war sehr einheimisch, das hat uns gut gefallen. This property is a true gem! This property is a true gem! My children all loved the pool, the property and the home. My husband and I were so thankful for all Mirco e Laura did to welcome our family and help us. We loved having a private fenced in garden area to let our children play in. The private garden area also served as a great place for meals. The home was very clean and had a ton of space. The grounds, the pool and the views are amazing. I would highly recommend this property! 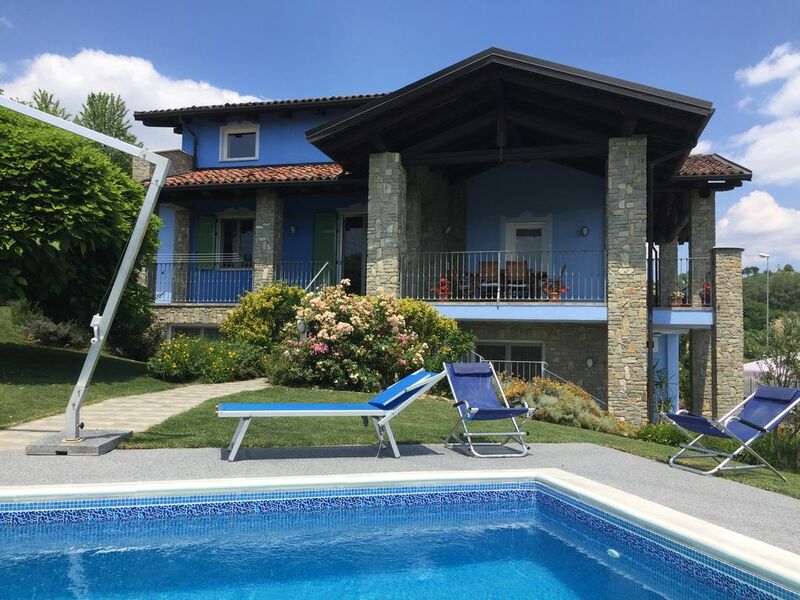 An amazing place to stay in the Langhe hills. Amazing views from the apartment where you have uninterrupted views of the hills. Swimming pool was great too, again with great views of the hills. We visited many of the restaurants and villages mentioned in his recommendations all of which were great. We spent days by the pool having the whole place to ourselves, surrounded by the hills and blue skies. We had a great time in Piemonte and in La Casa Blu! Thanks a lot for your good care. Een prachtige locatie, een gastvrij gezin. Langhe, Monferrato and Roero, Unesco Heritage, is a hilly area surrounded by vineyards, hazelnuts, charming landscapes, castles and ancient villages rich in history and traditions. Land full of places to visit to discover an invaluable cultural, artistic, landscaped and enogastronomic heritage. Land of unique flavors like its great wines: Barolo, Barbaresco, Barbera, Moscato, Asti. Meta appreciated by tourists looking for a relaxing holiday among vineyards and hills surrounded by woods of Faggi and Querce that guard their most precious secret: The White Truffle. Casa Blu is located in a strategic position starting point of different itineraries: from a walk through palaces, La Casa Blu towers and medieval streets to a trip to rediscover the typical products of Langhe, Monferrato and Roero or even to an excursion among the Woods and vineyards, perhaps riding a stop in the local wine cellars for tasting their precious wines.